Sick package from TRG & Dub U, with the extra bonus of a completely essential 2562 remix for you to get your paws on. 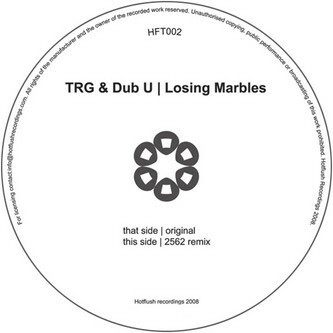 TRG & Dub U's 'Losing Marbles' is easily the finest track they've put their name to, coming from a far more experimental angle than their previous ravier and breakstep efforts and instead sounding closer to Alva Noto or early Pole than anything else. The track itself is built from a submerged 2-step template, embedded deep within rich swathes of analog crackle and detritus and treated wih delicate electronic embellishments you'd more likely hear on a Raster Noton record, it's spellbinding stuff. 2562 predictably delivers another priceless remix job on the flip, sticking with the dense atmospherics and working some brittle funk into the rhythm whilst sliding some lubricted bass swoops underneath to turn in another completely essential 2562 joint. This is surely set to become one of the biggest 12"s of the year for fans of Burial, Pole, Basic Channel and all that other deeeeep stuff that we just can't get enough of. Sheer briliiance - Essential Purchase.